Winter tires were invented by the Finnish in 1934 for commercial vehicles, but after being around for 80 years, some still refuse to use them despite the huge advantage they provide. Just like with most poorly maintained cars, you can get away with not having proper tires if you're lucky, but summer tires on a wintry day are roughly the equivalent of having faulty brakes and you wouldn't take that chance, would you? Some of the fairy tales surrounding this are that chains are enough for the job, that you don't need winters tires for all-wheel drive vehicles and that they're generally unnecessary in the city because you're driving too slowly. Well, the only problem is that all-wheel drive can't work without traction, chains can only be used in extreme weather and lower speeds just mean you'll crash into something slower at lower speeds. The cost issue is also nonsense since you can use the same set of winter tires for more than a decade if you store them properly in the summer. Despite being French, Michelin came prepared with lots of numbers, some of which are pretty astonishing. Like that they have 6,600 employees working on the tires with 350 different fields of expertise from meteorologists to biochemists equipped with 400 unique tools to simulate every possible situation. 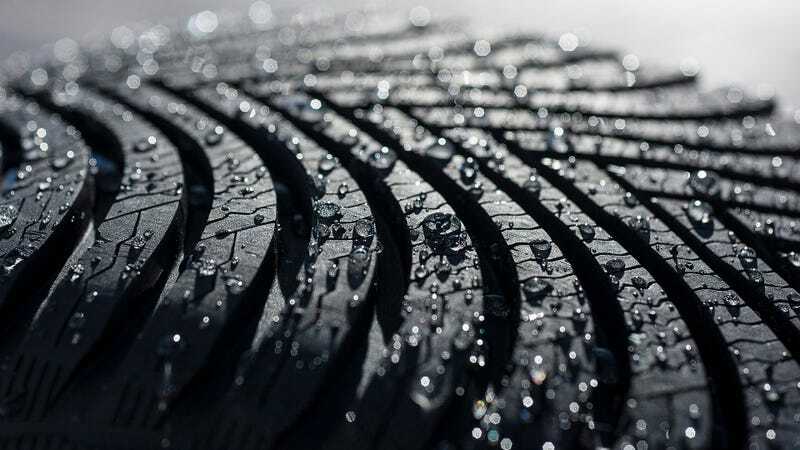 They also complete 75,000 consumer tests annually with Michelin tires running 1.1 billion miles every year, meaning that they go around the would in every twelve seconds. Count to ten, add two and they've done it again! But none of that effort goes to waste as developing a good tire takes about as much time as a complete car: four years. The creation of their latest one, the Alpin 5, started by them looking at the map of Europe. Other regions didn't matter in this case as every continent is getting a specific version. The European is a tough one because they have to take at least three different climates into consideration and since this is no racing, one tire has to rule them all. There is no spring in the tire business but a long winter that lasts from October to April. It's the temperatures that count and the average has to stay under 44 Fahrenheit. The mixture of sunflower oil, silicone and another 200 components known as the rubber compound only works in that range. At this point, the meteorologists step in to tell the rest of the crew how Copenhagen has 61 rainy days while Rome has only 51 with Bucharest being even drier at 44 during that testing period. Another bunch of experts from the University of Dresden also add that after researching the subject for 12 years through 12,000 cases, they concluded that one third of winter accidents happen in wet, with 16% being in a curve. It's had to follow already, but they also claim that snow makes the risk five times higher, while the most important thing remains to work in a completely clean road without any ice or snow as 92% of accidents happen in such ideal conditions. Two things can help apart from the experience gained in the last eight decades. One is their current tire on the market, the Alpin 4, the other is all those prototype tires they make before settling on the final design. Those are all good in one thing. Being quiet or durable, having a lot of grip or being capable of higher speeds. The job is to unite these qualities, creating a compound and a tread that can do all. Luckily, the rubber itself is quite amazing. For example, it can alter its elasticity depending on the level of energy involved. That's important because lower and higher speeds are hardly the same when it comes to centrifugal forces, not to mention the heat. The contact patch also has to be cut in such a way that it deports water while grabbing the ice and having enough grip on any road. Compared to the Alpine 4, they managed to scratch more blocks and sipes on the new one, and in order not to lose any of the grip, the blocks that act like a caterpillar on snow are shutting the grooves once in the clear, creating an almost slick surface just by using the car's weight. It's only a tire, but it's a clever one. All this comes to Michelin claiming that the Alpin 5 performs five percent better on a wet road and three percent better on snow than its predecessor. Doesn't sound like much, but every little bit counts. My calculations are far less accurate. I've never tried the Alpin 4 and when it comes to the Alpin 5, I can only tell you that after I jumped into a Volvo V40 R-Design with quite a lot of torque and drove it around in Tyrol in such a manner that my passenger needed some air halfway thorough the mountains, we survived with no drama at all. That sums up what I think of Michelin's latest product. But they didn't leave it at that. After we went to a local test track, we tried Michelin's summer tire against the winter one. You can guess the results but they say from 50 mph, the difference in the braking distance is 13 feet. In Europe, the average pedestrian crossing is 10 feet wide. But is Michelin the best? Well, one of for sure because they weren't afraid to compare the Alpin 5 to the current leader in the segment either, which happens to be a Continental. That's a two year-old tire which means it will remain on the shelves for a while to compete with the French. They did not cheat. I found no grease on the German tires, the pressure was spot on and therefore the Continentals did almost as well as the new Michelins. Which means you're probably safe to choose both. What's the difference then? Well, if we stick with these two companies, their strategies are interesting yet very unique on both sides. Continental has the benefit of making everything from electronics to safety systems and drivetrain components, which means they can develop tires parallel with other technologies in house. That's pretty efficient. Michelin on the other hand is building a database at the moment. So far, 3,000 chosen drivers have a measuring device in their cars which uses GPS to record distance, speed, the intensity of braking and acceleration and the actual fuel consumption with the exact coordinates, linked to all the information about the local weather. By analyzing this endless stream of data, Michelin will get a picture of how their tires perform taking everything from driving styles to geographic differences into account. It's March, but winter is coming, so get ready for it this year.